Test out your 3D design abilities in the BOSEbuild Design Challenge! Brought to you by Bose and Ultimaker, this challenge provides you with the opportunity to customize an enclosure for the BOSEbuild Speaker Cube! There are also two special judges’ prizes for the best designs using Tinkercad and Fusion 360! Get your copy of Fusion 360 today; it’s free for hobbyists and startups & students and educators. Unlike other contests, you don't create an Instructable to enter. Instead, simply download the start files provided, open your favorite 3D modeling program, and design a custom enclosure for the speaker. Once you have your design, you can enter the STL files and images right here on the contest page where it says Enter Now! Submit the design as both an STL file and the native file type for whichever 3D modeling program you used. Upload your complete design and any individual panels, silhouette decals, or assembly clips as well. The team at Bose will be test-printing several designs and individual pieces to try them out in real life! For a Tinkercad file, please submit a public link along with your design files. Have a question? Post general inquiries about Design Challenges to this forum topic. 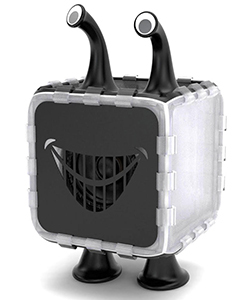 Visit this forum topic if you have a specific question about the Speaker Cube Kit! The BOSEBuild Design Challenge is closed. Upload a design to enter by clicking "Enter Now!" at the top of the contest page. Design entries must be published between Jun 19, 2017 and Jul 31, 2017 (11:59pm PT) to be eligible. Once published, the designs will be entered in the contest. Sponsor. The Instructables BOSEBuild Design Challenge (the "Contest") is an on-line contest with skill, ability and knowledge components that is sponsored by Autodesk, Inc., a Delaware corporation having its principal office at 111 McInnis Parkway, San Rafael, CA 94103, USA ("Sponsor"), in connection with the Instructables service and website, www.instructables.com, (the "Sponsor Site"). The Contest is co-sponsored by the company or companies listed here, if any (each, a "Co-Sponsor"): The Contest is governed by these Official Rules (these "Rules"). For any questions regarding the Contest, the Sponsor may be contacted by email at [service@instructables.com] or by mail at the address identified in Section B.18 ("Winner's List; Mailing List") below. Winner Selection. There will be 21 total winner(s) for the Contest. The winner(s) will be selected on August 07, 2017, and Sponsor will announce the winner(s) on August 08, 2017. Each winner will be awarded only the prize(s) for which that winner was selected, as described below. Exclusions from Eligibility. Employees of Sponsor, any Co-Sponsor, or their respective parents, subsidiaries, affiliates, partners, suppliers, or advertising or promotional agencies (including without limitation any Judges who are employees of Sponsor, any Co-Sponsor or any of their respective parents, subsidiaries, or affiliates), as well as members of their households or their immediate families (i.e., spouses, parents and children), may submit entries in the Contest, but any such entries are for information and entertainment purposes only and are not eligible to be considered for the purpose of selecting finalists or winners. Judges who are not employees of Sponsor, any Co-Sponsor or any of their respective parents, subsidiaries, or affiliates, are not eligible to enter or win, nor are members of their households or their immediate families (i.e., spouses, parents and children). Notwithstanding the foregoing, Sponsor shall have no liability to any entrant or any other person in the event that Sponsor inadvertently awards a prize to any non-eligible person(s). In addition, each entrant acknowledges and accepts that Sponsor may be prohibited by applicable law from permitting entry by or awarding a prize to any person falling into one or more of the following prohibited categories: (a) a national or resident of Cuba, Iran, Iraq, Libya, North Korea, Sudan, Syria or any other country for which trade with the United States has been prohibited or restricted by any statute, regulation, order, rule, treaty, or other law of the United States or any other applicable jurisdiction in any manner that would prevent the awarding or delivery of any prize to the entrant; (b) a person on the U.S. Table of Denial Orders, Entity List, List of Specially Designated Nationals and Blocked Persons, or any other similar list of any applicable jurisdiction, or any person affiliated with any person or entity on any such list; (c) an official or representative of any foreign government; or (d) any other person to whom the awarding or delivery of any prize would violate any applicable statute, regulation, order, rule, treaty, or other law or any of Sponsor\'s policies. If an entrant falls into any of the above prohibited categories, such entrant is not eligible to win any prizes. © 2015 Autodesk, Inc. All rights reserved.